The Summer Camp kitchen never sleeps. When you are producing 3 meals per day and a healthy snack for upwards of 500 campers and staff, the impact of efficiency in the Camp kitchen is easily visible. An efficiently run kitchen will prepare and cook the right amount of food for the required number of people, on time, by the most effective use of staff, ingredients and equipment. Sound easy….? Not so much. The limit of 24 hours in a day and the importance of details can be a bit overwhelming. Listen to employee feedback. Feeling as if “your way” is the best way is a pitfall that many of us get caught in. A good leader listens to their staff by really paying attention to what they are saying, seeing the process through their perspectives and being open to their recommendations. Stand back and watch the process in order to get a larger picture of the workflow and speak to kitchen staff about things that can be done in a more efficient way. Especially when you have domestic or foreign staff who have never been in a kitchen before. Create an efficient menu. While you may want to throw out a plethora of creative and amazing dishes, you may not always have the right kitchen setup, equipment, or skilled enough staff to do so. 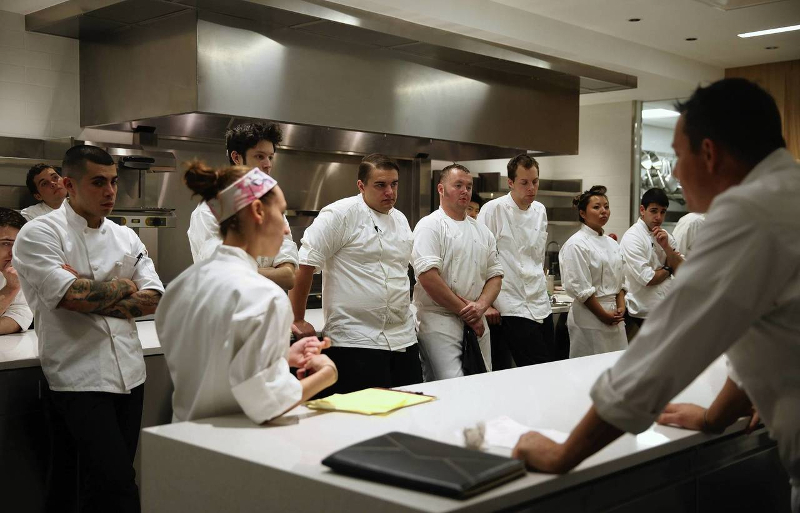 Be practical in streamlining your menu to play to the strengths of your kitchen and its staff. The menu should not put extra burden on your staff. Choose recipes that fit into the budget. Remember, at Camp good food is about taste more than presentation! Create SOP Manuals. This may seem to be tedious and many may not see the value in it but it comes with a huge upside. It is important to have a well thought out and established standard operating procedures. This drives consistency throughout the kitchen. Make sure that your staff know what these procedures by reviewing them throughout the season and do spot checks to ensure that they are being followed. Remember to update the SOP’s any time you find a better way of doing things or if new laws or regulations impact the operation. Inventory management. Running out of ingredients in the middle of preparation and/or cooking can really slow down the production train. Keep a good inventory system in order to know when you need to restock items. This will also help with waste management and ensuring that you are keeping it to a minimum. Prep, prep, prep. Prep what you can ahead of time. This is such an integral part of keeping ahead of the eight ball and I really hold this at a high priority. While freshness is vital in any kitchen, there are always many preparations that should be done ahead of time to increase efficiency. For example potatoes can be peeled and cut much in advance to mashed potato day, taco meat can be cooked the day before and reheated with no effect on taste and chicken can even be marked on the grill and finished off the next day before the meal. None of this will happen overnight, but if you start making small improvements every day, you will be amazed at how much more efficient your kitchen will run and you will have happier campers and staff to prove it. Being open to change and willing to work hard a long side your staff will keep your moral in the kitchen high and promote a respectable and efficient atmosphere.